Regiment/Catrawd: 'B' Company, 13th Battalion, Royal Welsh Fusiliers. Service Rank and Number / Rheng gwasanaeth a rhif: Private No. 16293. Military Cemetery/Memorial / Fynwent milwrol: Royal Irish Rifles Graveyard, Laventie, Pas de Calais. Ref No Grave or Memorial / Rhif cyfeirnod bedd: Plot: 11. Row: F. Grave: 1. Killed in action on Sunday 14 May 1916 during the Battle of the Somme, aged 26 years. William Conway Jones was born in Rhyl, Flintshire in 1890. The 1911 Census shows that the family lived at 48 West Parade, Rhyl, Flintshire. The head of the family was John Jones aged 61, who was employed as a Supervisor at Rhyl Post Office. His wife Anne Jones aged 60 and their four children – Edith Conway Jones aged 25, a Domestic Servant, Margaret Mary Jones aged 23, William Conway Jones aged 21, a Solicitor’s Clerk and Anne Conway Jones aged 18, a Milliner. Following the outbreak of the First World War, William enlisted at the Recruitment Centre, Rhyl with 13th Battalion, Royal Welsh Fusiliers. He arrived in France with the Battalion on Wednesday 1 December 1915. Rhyl Journal 27 May 1916. 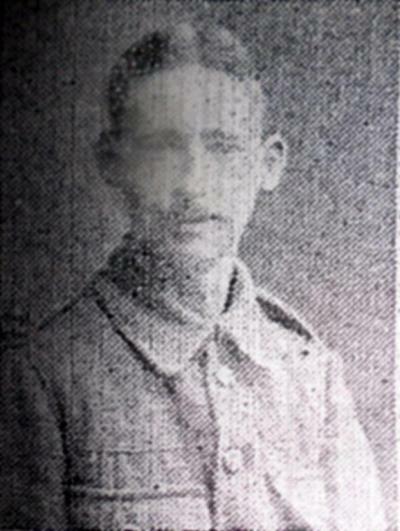 As shortly reported in last weeks paper, there has to be added to the Roll of Honour of the gallant Rhyl boy’s the name of Private William Conroy Jones, youngest son of Mr John Jones, Glas Alaw, 48 West Parade, Rhyl, who was killed on Sunday night, the 14th inst. He was in his 27th year and for some time before enlisting in the 1st North Wales Pals, was engaged in the offices of late Messrs Oliver George and Edward George. He was an old County School boy and the first member of Clwyd Street C.M. Chapel to sacrifice his life for King and Country. An extract from his Major’s letter, carrying the sad news to his parents is as follows:- ‘It is with the greatest regret that I have to inform you of the death of your son Conway. He was killed last night while putting out wire entanglements in our support line. He was one of the original members of my company and had always been a steady and conscientious soldier and I shall miss him. It is sad he was just about to receive his commission, nevertheless you have the satisfaction of knowing that he died doing his duty for his country no less than any other man or officer who has received distinction for doing the same. Please accept my sincerest sympathy with you and your family. I shall attend his funeral tonight and am glad to know that his brother will also be able to be present’. Captain D Llewellyn Williams RAMC and several of his Rhyl comrades were also present. His eldest brother, Sergeant Stephen Conway Jones was with him (they were not in the same Battalion), for several hours on the Sunday before he went on duty, and as stated by the Major, present at the funeral in one of the many British Military Cemeteries on Monday the 15th. The Welsh Chaplin the Reverend Hugh Jones, Glanyddan, Llandudno officiated in English and Welsh. Much sympathy has been extended to his sorrowing parents and family, in their further severe loss, a sad feature being the receipt of a long letter, written before his death on the Sunday, but only received on Saturday last, having evidently being delayed in some way. This was in his usual bright and ‘newsy’ vein, right from the trenches. His was the last name on the Roll of Honour read by Captain Hardern on Empire Sunday last, almost opposite his home in West Parade. Rhyl Journal 28 May 1916 – Another Rhyl Soldier Killed. Mr John Jones of Glas Alaw, Rhyl was yesterday notified that his youngest son Private William Conway Jones of the Royal Welsh Fusiliers had been killed in action in France at the age of 27 years. The deceased joined the North Wales Pals soon after the outbreak of the war and had been at the fron about 6 months. We understand that he was almost on the point of returning home to prepare for a commission for which he had been recommended. He will be remembered by many as having served for several years in the offices of the late Mr Edward George (Solicitors). He is the first on the Clwyd Street CM Roll of Honour to sacrifice his life. On 13 July 1916, a payment of £4. 3s. 8d. was made by the War Office to Mr John Jones, being monies owed to his son William. On 27 August 1919, a further payment which is recorded as a War Gratuity of £7. 0s. 0d. was also made to him. 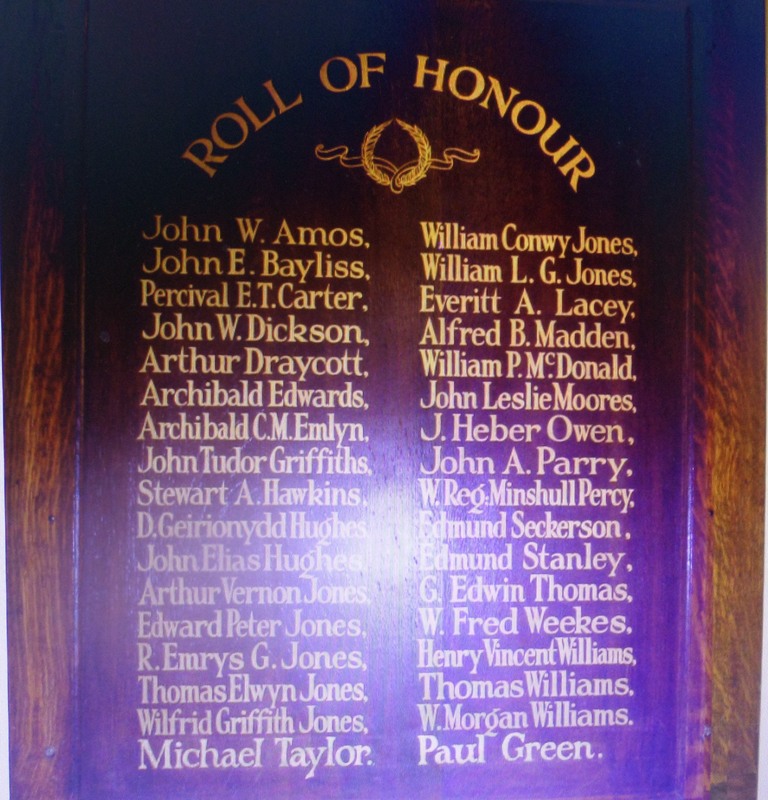 Private William Conway Jones is remembered on a Roll of Honour Plaque which was displayed at The County School, Grange Road, Rhyl. There is a Flintshire Roll of Honour Card for him at the County Archives Office, Hawarden, Flintshire, which is unsigned and undated.